Yesterday, we went to check on the Uptown pair. It seems that “Guy” (b/g G/G), longtime Uptown adult male, has been replaced by his son Stan (b/g 98/K). This mother-son pairing isn’t completely unheard of. In fact, we had another mother-son pair in Hyde Park for awhile — Magnolia and Eddie. Eddie, in fact, wasn’t given a name when he was banded and so the monitors down there coined him “Eddie” for Oedipus. Pretty funny. Anyway, back to the Uptown. No idea to this point whether G/G was killed by his son, whether he died on his own or whether he is still out there somewhere alive and for some reason abandoned the nest. 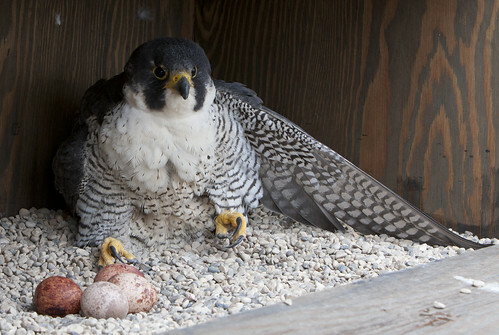 Presently, Zoom is sitting on 4 eggs, so things look good for the new pair. Keep you posted! ~ by Steph on April 19, 2011.